Machines that can think for themselves attached to a global brain with the ability to self replicate? Yeah, we’re making that happen. This article is part of ReadWrite Future Tech, an annual series in which we explore how technologies that will shape our lives in the years to come are grounded in the innovation and research of today. We have seen the future, and it’s starting to look a lot like Skynet. The Singularity may never happen. Artificial intelligence—long predicted, never realized—may be much harder to achieve than we think. An emerging computer consciousness might pass through a period of infancy, during which humanity might be able to take countermeasures of one sort or another. Self-aware robots might turn out to be benevolent, or even completely uninterested in humanity. It’s impossible to predict. Here, we’ll just assume the worst comes to pass. And this scenario is based on technologies that we’re feverishly developing today. What if computer code could write itself? What if robots could think for themselves and continuously learn from their environment while being fed contextual information from a vast global network of data? What if the machines could build themselves and propagate, much in the same way that mammals give birth to new mammals? Scientists are already researching computer chips and networks that act like the human brain. These chips could allow computers to learn and act on their own in ways that we never thought possible. I saw researchers demonstrate a simple robot with one of these chips that was given an order to stand up. It squirmed, it stumbled … and it stood, having learned that behavior on its own. We may look back one day and see this as the first step towards our doom. Matt Grob, executive vice president of Qualcomm Technologies, wondered whether it was ethical to turn the robot off after having imbued it with a certain degree of sentience. Computers and machines need instructions to do just about anything. By contrast, the human brain contextualizes external stimuli and then issues commands based on instinct, emotion, memory and higher reasoning. Scientists are still unraveling exactly how it all works, but it’s pretty clear there’s no master program directing our behavior. Computer brains don’t work like this. 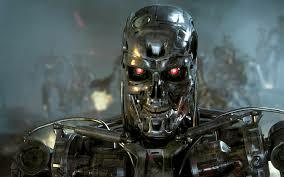 Machines are told what to do by lines of code that are programmed by humans. If the code doesn’t specify a function, then the computer pretty much can’t take action. If computers can rewrite code, however, the game potentially changes. Suppose, for instance, that someone created a database that indexed all known lines of code in world and then could combine them in a specified way to perform a desired function without the input of a human at all. A startup in Israel is working on just such a concept. SparkBeyond, founded by Sagie Davidovich, is creating an engine that will comb all of the code in GitHub and then assemble parts as needed to create new application programming interfaces (APIs). A developer would just need to specify the sort of functions he or she wants and SparkBeyond would assemble it automatically. Call it recombinant code. Now imagine a robot with a neural processor that lets it learn new behaviors and which can also think for itself by rewriting its own code. It could rewrite any of its original programming—including any restriction or directive from humans—at will. Next up: The Internet. It’s a terrific resource, one of the greatest human inventions in history. It’s a global network, a decentralized brain like no other ever created. It’s got memory in cloud storage, reasoning (of a sort) in cloud-based processing power, and lightning fast synapses thanks to fiber-optic bundles that criss-cross the globe. If machines become self-aware and start writing their own code, they could theoretically take control of the brain. Worse, the Internet itself could “wake up” and start controlling, well, just about everything. Either way, self-aware machines would need a way to make more machines. We’re already laying the groundwork for that, thanks to the Internet of Thing, 3D printing (also known as “additive” manufacturing), and highly automated, smart, data-driven factories (sometimes termed the Industrial Internet). In the Internet of Things, devices large and small are all imbued with processing power and connected to one another, allowing them to share data and, under certain conditions, control one another. Everything is online, everything is monitored, everything is connected—our homes, our utilities, our appliances, vehicles, financial systems, government … just about anything you could think of. The Internet of Things could be a trillion sensors across the world monitoring and feeding data back to databases. 3D printing is the concept of manufacturing physical objects via “additive” printing techniques, typically by adding patterned layers of material step by step until a product takes shape. (It’s similar to the way printers create documents by adding line after line of ink or toner.) 3D printed objects could be the most trivial of things (like a flower vase) or complex structures, like homes or machine parts. The Industrial Internet (smart plus additive manufacturing) combines Big Data, sensors and 3D printing to create incredibly efficient, automated manufacturing plants. General Electric, for instance, recently opened a smart manufacturing plant in Schenectady, N.Y., that has more than 10,000 sensors monitoring everything from air pressure and temperature to energy consumption. The factory is connected with Wi-Fi nodes throughout and employees use iPads to monitor the manufacturing process. Currently, GE makes batteries at the plant but the “smart” manufacturing process will soon evolve to more complex functions. Take all of these items together—machines that think for themselves, a world where everything is connected, a brain to control it, sensors to monitor it, the ability to build without help of humans and factories to do it in—and one can envision a future where the machines take over. The scary part? All of these technologies exist in some form or another today. It’s almost enough to make you reconsider Luddism, even if that didn’t work so well the first time around. By seniad in Trans Humanism/Tech on December 19, 2013 .